The 52" Bouras Double Bath Vanity was designed to perfectly blend the beauty of a warm cabinet finish with the charms of traditional styles. Featuring a beautiful, warm Walnut finish, this vanity boasts two single-door cabinets with four drawers of storage space to make organizing and storing your bathroom essentials an easy ordeal to solve. The top is made from a Baltic Brown Granite and is matched with an ivory ceramic undermount sink. 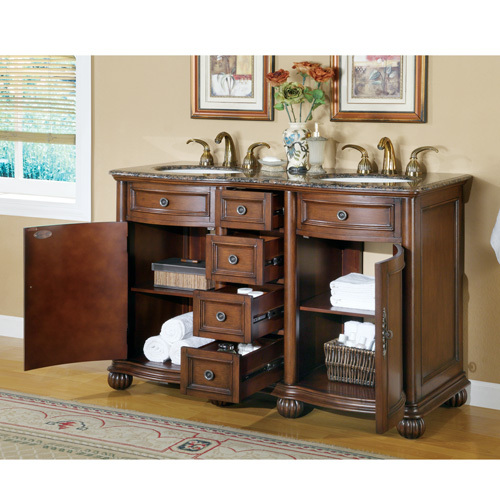 You'll love the cozy looks and the functionality of the Bouras in your bathroom.